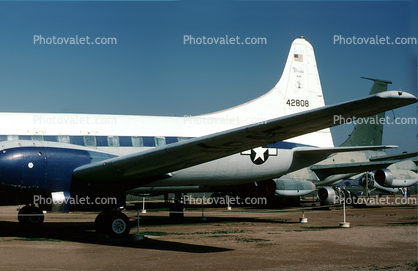 This aircraft was built by Consolodated-Vultee (Convair) at San Diego, California, USA. October 1954: 1299th Air Transport Squadron. May 1956: 4500th Support Squadron. March 1960: 4500th Air Base Wing. February 1964: 1001st Air Base Wing. July 1968: The 1001th Air Base Wing name was changed to the 1001st Composite Wing. April 1975 The aircraft was allocated to the 125th Fighter Intercepter Group, Florida Air National Guard. May 31, 1989: retired from USAF service. 1989 This aircraft was acquired by the March Field Aviation Museum as seen here.